The Seattle Times’ LiveWire event on visions for the public education system focused on what’s working in schools, and how issues can be addressed through more than just money. 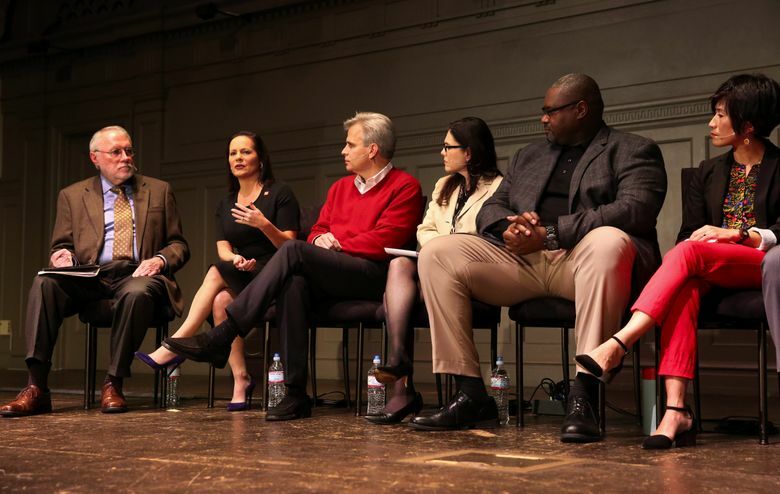 In a sometimes fiery discussion Wednesday at Town Hall Seattle, seven educators, policymakers and education advocates shared successes they’ve seen and ended by offering their vision for what a perfect education system would look like in 2022. In-between, there was some back-and-forth with the audience around funding issues, along with discussion on everything from teacher pay to the need for more social and emotional support for students. Among the ideas for 2022: counselors at every school, a smooth transition from high school to higher education, a teacher workforce that feels fully supported and compensated, and free preschool for every child. Jeff Charbonneau, a teacher at Zillah High School in Central Washington and the 2013 National Teacher of the Year, started off the panel by saying the narrative about the public-education system needs to change. Zillah High School science teacher Jeff Charbonneau, the 2013 National Teacher of the Year, describes what the narrative of public education should be, that students are achieving higher than ever before. “I do not believe we are a nation or a state of failing schools,” he said to applause. While the current graduation rates — about 78 percent — aren’t high enough, he added, “No CEO would go in front of their company and say their employees are failures.” And he stressed that students are achieving more than they have in the past. Highline Superintendent Susan Enfield focused on her view that teachers have more responsibilities than just academics, and those responsibilities keep growing as support services diminish. Susan Enfield, superintendent for Highline Public Schools, says that the schools should not be solely relied upon to provide social services and mental health services for children and families. The panelists also talked about money, especially given the 2012 Supreme Court ruling that Washington is violating the rights of the state’s 1 million school children by underfunding public education. Lawmakers have added more than $2 billion to the state’s education budget but still haven’t fully complied with the decision; the court is fining the state $100,000 a day. Washington State Representative Eric Pettigrew and Washington State Senator Steve Litzow explain that, while education is the most important focus for lawmakers, the solutions are complicated and partisan. The two state legislators on the panel, Sen. Steve Litzow, R-Mercer Island, and Rep. Eric Pettigrew, D-Renton, agreed that education is the most important focus for lawmakers. But all districts want different things, Litzow said. And it’s difficult to balance competing interests. Pettigrew stressed the need for giving individual schools more power over how money is spent. Washington State Representative Eric Pettigrew pledges to work on ensuring that every dollar put into the education system results in positive outcomes for students. The panel also included Spokane Superintendent Shelley Redinger; Mia Tuan, dean of the University of Washington College of Education; and Steve Mullin, president of the Washington Roundtable, a business group. Mia Tuan, dean of the University of Washington College of Education, describes how the politics surrounding education in Washington is different than in other states that she has lived. At the end of the event, the moderators — Kate Riley, Seattle Times editorial-page editor, and former Seattle Times executive editor Michael Fancher — asked each panelist what their 2022 vision was — but also how they were going to work to achieve it. Redinger said she planned to lobby in Olympia, while Enfield said she would continue in her role, saying most superintendents leave too soon.